We got up at 3am….packed and away we went by 4am. The drive went smooth and we stopped a couple of times. On the way to the coast, I finally got to meet my sister after 30 years… Mary-Ann is beautiful, smart and gave me a framed picture of our father. Her husband and boys were so lovely and everyone made us feel so welcome. We had a great huge breakfast at her gorgeous house set in a country estate. Eventually we got on the road for the final stretch, stopping along the way to feel the sand between our toes. We miss Nic who had to work. Our accommodation is spacious enough for all of us, boys and girls in two rooms sharing a bathroom and my husband and I sharing a room and bathroom. Not as extravagant as when we travel alone, but functional with kids! Tranquil Body Treats for both bathrooms! Ha ha ha! The kids have got strawberry all round which smells delicious. No complaints there! Noid and I have got lavender. First time for both these fragrances for us. At home I use Vanilla and the kids Lemon Grass. We unpacked and off to the beach to show the girls my favourite beach….the boys soon joined! Except Kev who stayed at the cottage…the kid really doesn’t love the sand! I sat on the sand trying to keep an eye on all as Noid went into the sea with the kids. Jenna-Lee had a nasty fall and surgery this week so she can’t get the cut on her face wet…so she jumped over shallow waves and build sand castles next to me. Dinner was a most fantastic meal at Larry’s on the beach front in Margate. Awesome food!!! Everyone was very happy. We decided to have a sign made as is tradition at the restaurant that says “The Waltons 2011”. Will be up in two days and will go take a pic then. Kev fell carrying a sleeping Jenna-Lee to the car. He protected her and she was all fine, but Kev has hurt his knee and is now limping. We were all in bed soon after, exhausted! Oh enjoy your holiday! 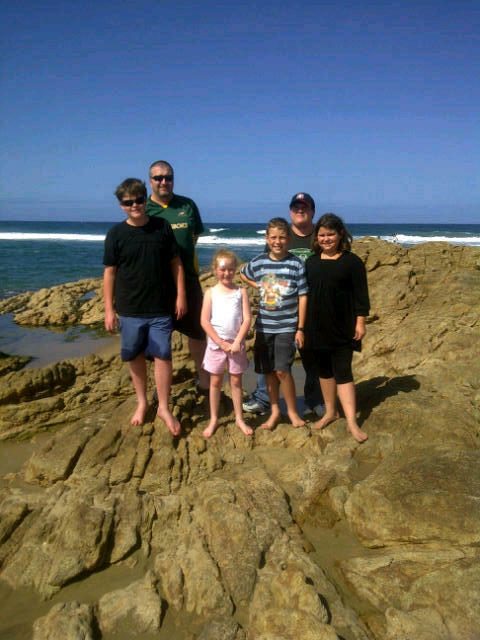 I love the South Coast – ag, I just love the coast in general. In just a month we will be at our little San lameer happy place. Love Uvongo though – many childhood holidays there. Nice to be here with everyone (except Nic).